Today our Birdorable Bonanza: 2015 Advent Edition continues with a grouse-like bird from South America: the Blue-billed Curassow. The Blue-billed Curassow is a large species endemic to Colombia in South America. Males, like our cute Birdorable version here, have a mostly black plumage with a white vent and white barring at the end of the tail. Both males and females have a crest at the top of the head made of curly feathers. According to the IUCN Red List of Threatened Species, the Blue-billed Curassow is critically endangered. The current wild population is estimated to be 700 adult individuals or fewer. The population trend is decreasing due to various factors including habitat loss and hunting of both birds and eggs. Conservation groups including zoos, like the Houston Zoo, have been working to save the species from extinction. More than 50 of the birds have been hatched at the zoo in their ongoing efforts. 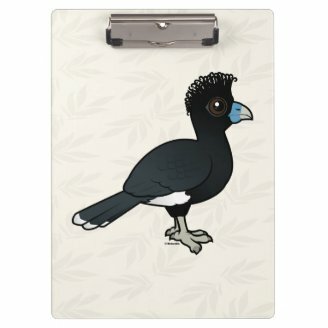 The Blue-billed Curassow is our 619th Birdorable bird. 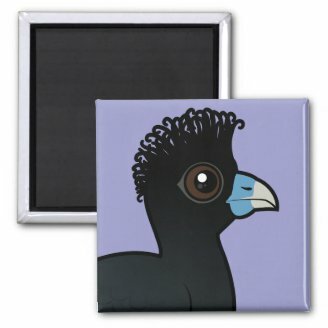 Be sure to check out our collection of apparel and gifts featuring the Birdorable Blue-billed Curassow! Tomorrow's bird is a beautiful duck from East Asia. It has a red bill and colorful striking plumage. Can you guess what it will be? 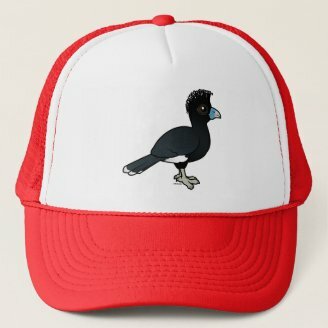 3 comments on "2015 Bonanza Bird #3: Blue-billed Curassow"
Hey! You forgot about the ponytail that's used in sisterhood owin.